Weight loss is one of the most hotly debated topics in the world. Everyone and their cat seems to be a weight loss expert. The problem is that most people are filled with counter-intuitive advice. Some popularly believed weight loss tips are simply not useful. But many weight loss tips are actually unhealthy and damaging. Many people find themselves spinning their wheels when it comes to weight loss and it’s usually because they are following advice that is just plain wrong. 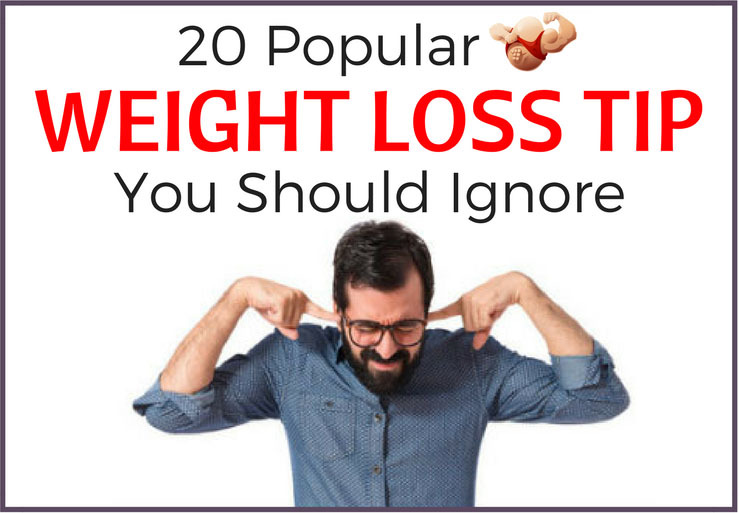 Let’s take a look at 20 weight loss tips to ignore completely. My best weight loss has always happened when I’ve been following an intermittent fasting style of dieting. That means I skip breakfast and I sometimes skip lunch. Whenever I do this, I have a lean body with visible abs and I feel fantastic. Funnily enough, I have more energy when I do this. I also have less inflammation and more well-being. Yet countless times people who are overweight and unhealthy (some of them even smoke) have told me that breakfast is the most important meal of the day. I’ve been told that skipping breakfast is wildly unhealthy and will actually stop you from losing weight. Huh? The fact of the matter is that things aren’t so black and white. Yes, breakfast can be the most important meal of the day. If you have a protein-rich breakfast with healthy carbs and fats, it can really set you up for the day and help your fat-loss. But it’s also true that skipping breakfast can accelerate your fat-los﻿﻿s and make you feel great. 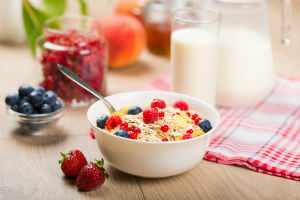 To say that you must eat breakfast in order to lose weight is simply not true. Lots of people will begin a weight loss diet filled with motivation. They will start attacking the gym relentlessly and will spend hours every day on the treadmill. This is very unproductive and can result in massive burn out if you are not used to the volume of exercise. You must build up your exercise gradually. 20-30 minutes a day for 4-5 days a week is perfectly fine when starting out. 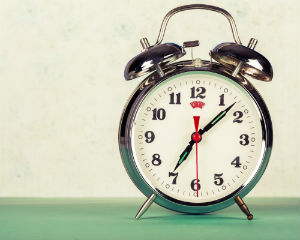 If you leap right into running hours a day from the beginning, where do you go from there? Overdoing it on the cardio can also make you hungrier and give your body a real beating. At the beginning begin with an amount of cardio that is just outside of your comfort zone. Losing weightis a marathon, not a sprint. 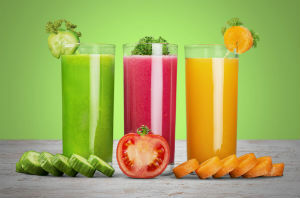 Juice cleanses can be a great way to detox and break unhealthy attachments to food. However, many juice cleanses can be wildly unhealthy. They are also not the best way to lose weight. The main source of weight loss on a juice cleanse diet is typically water weight loss. You might lose a few pounds of fat but you’ll also lose muscle too. If the juice cleanse is giving you diarrhea 5 times a day, do you really think that's a great way to lose weight? Also, most people gain the weight back immediately after stopping the juice cleanse. I’m not saying juice cleanses are bad, per se. But you have to understand why you are doing a juice cleanse and you have to understand their limits. They are not a sustainable solution to weight loss. This weight loss myth has surely died by now, right? Well, not quite. I still have people asking me to confirm if low fat is the best way to go. Often I will have people say something like, “I can’t eat that. It has fat in it and I’m trying to lose weight”. Let’s set the record straight. You don’t have to eat low fat to lose fat. In fact, this can often be counter-productive. You need healthy fats in your diet. Healthy fats can be found in fish like salmon and tilapia, eggs, meat, and in nuts. Healthy fats improve the fat burning hormones in your body like testosterone. Healthy fats also keep you fuller for longer and do not give you crazy blood sugar highs and crashes. Just be careful to keep your calories within range because fats have twice as many calories as protein and carbs. There are some people that believe fat is evil. But then there are people on the opposite side of the fence who believe that you can eat as much fat as you want as long as you don’t eat carbs. This is partly due to the Atkins Diet craze in which many people misinterpreted the rules of the diet and believe you could slam back pounds and pounds of bacon, cheese, and olive oil while shredding unwanted fat. This simply isn’t true. Sure, you have more wiggle room when following a low-carb diet because your insulin sensitivity is massively improved. But that still doesn’t mean you can eat 20,000 calories a day of fatty foods. Calories do still matter and fats, even healthy fats, contain a lot of calories. Do you know what happens when you take your calories too low for too long? Your body shuts down. It starts trying to preserve energy (e.g. 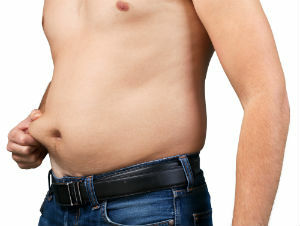 the fat you want to lose) and sacrificing other things in your body (like muscle). A funny thing happens when you drastically cut calories. You stop getting hungry. That’s the sign that something is wrong and you are screwing with your thyroid. Getting hungry on a diet is a good thing. If you stop getting hungry, you might just be taking your calories too low, which is counterproductive. If you want to know how many calories are optimal for weight loss, put your information into a calculator like the one on Fitness Frog. Once you’ve put your information in, the calculator will tell you how many calories you need to eat for maintenance. You’ll find that cutting your calories to 200-500 calories below maintenance to be optimal. Weight loss largely is a matter of eating less calories then you burn. However, many people have taken this to mean they can eat nothing but candy bars and ice cream as long as they are eating less calories than they burn. No, sorry. There is such a thing as good quality and bad quality weight loss. If you eat a low-calorie diet of healthy vegetables, lean protein, healthy fats, and quality carbs, you will lose fat and preserve muscle. If you just eat candy bars, you’re going to lose your muscle and hold onto your fat in all the worst places. You’ll look like slop. So make sure you are getting quality sources of food in addition to eating low calories. Women always ask me how they can lose fat from their thighs, arms, and face. Men always ask me how they can lose their beer belly. Sorry but it doesn’t work that way. Losing fat in a specific area simply isn’t possible. You need to lose fat everywhere in order to lose fat in a certain place. So, if you want six pack abs, you have to get lean all over your body. You can’t just do a certain exercise and end up losing all the fat from your belly. I’ll tell you want you’ll get if you try to do 1,000 sit-ups right now without prior training and experience. I’ll give you a clue: it’s not a six-pack. It’s a hernia. The only thing that’s going to reveal a set of chiselled washboard abs is proper diet and weight loss spread out over your entire body. Low-carb is a great way to lose weight. But it’s not necessarily the best way. Be wary of anyone citing any one particular method as gospel. People are different. We all have unique bodies with our own unique genetic make-up. Low-carb might work for me but be a disaster for you. 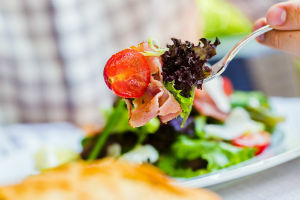 For example, if you’re a long distance runner, low-carb is likely to make you light-headed and ill because you might not get the energy you need. Also, the right diet for you is likely to change over time. I used to follow a low-carb diet but then I needed to switch to a high-carb diet because of sports. Low-carb is great but don’t worry if it’s not for you. There are plenty of great diets out there. Do you ever notice how the same overweight people are doing hours of cardio every day in the gym for years? They never seem to shift any weight yet they are always running, biking, or sweating on the elliptical machine. The reason is that long steady state cardio is often not the best way to lose weight. Don’t get me wrong, steady state cardio can be a great tool but you need to know how to use it properly to target fat loss. On it’s own, it’s great for health and a mental boost but, when you need to blast the fat, pair steady state cardio with high intensity interval training (HIIT). Do around 10 minutes of HIIT. This means 1 minute of sprinting alternated with 1 minute of walking (adjust the times based on your own current health status). Once you’ve done that, you’ve tapped into your body’s natural fat burning capabilities. You can then use 10-20 minutes of steady state cardio to burn even more fat. Steady state cardio for fat loss can be good first thing in the morning before eating too. I don’t understand people who try to lose weight with hours of cardio when they have something to eat beforehand. 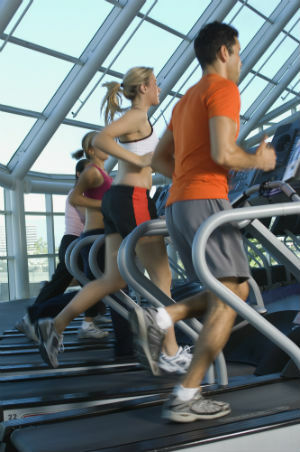 Keep the long cardio to 15 to 30 minutes and have an empty stomach to make sure you actually burn some fat. You always see this on click bait websites. This one secret food that doctors don’t want you to know about will magically make you lose 20 pounds this week. Not buying it! Are there foods that are naturally good for you? Sure, there are loads of foods that are bursting with antioxidants and will help to curb your appetite and accelerate fat loss. Are there foods that will do all the work for you? No. You still need to burn more calories than you eat and exercise sensibly. One food will not do the work for you. Concentrate on getting your diet and exercise and lifestyle dialled in, and then you can play around with foods that make a 0.01% difference. See the above answer. Again, there isn’t a magic exercise that will suddenly blitz all of your belly fat. You need to have a healthy fat-loss diet and you need to be consistent. You can’t just do a few sit-ups or do a Hindu squat for 30 seconds and be lean. It takes more work than that! It’s definitely a good idea to have protein in your diet. Protein is the building block of muscle. This means it will spare muscle when you are trying to lose fat. It can also keep you feeling fuller for longer. However, the protein supplement companies have lied to you. You don’t need 300g of protein a day when losing weight. 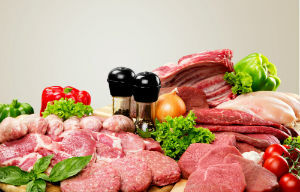 Sure, if you are a bodybuilder and you are going all out for your physique, you’re going to need a lot of protein. But the common man or woman exercising to lose weight? You don’t need huge amounts of protein. In fact, big servings of protein can actually be detrimental to your health and cause kidney problems. I recommend 0.5-1g of protein per pound of bodyweight when losing fat. That means if you are 150 lbs, your protein intake for the day will be between 75-150g of protein. “Does that contain carbs?” I hear that question all the time. 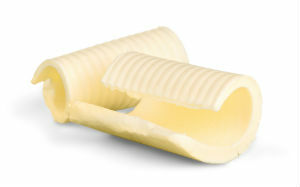 Low-carb diets have resulted in tons of dieters have a complex about carbs. Carbs are not evil. No food source can be called evil. There are better and worse food options for individuals based on their goals and current health status. There are some great sources of carbs such as rice and sweet potato. Then there are some source of carbs that contain empty calories and aren’t good for you, like cookies and soda. Remember, when losing weight, very few things are black and white. I often hear the rule about not eating after 7pm or 8pm or 9pm or [insert time here]. Sure, it’s not great to eat a big meal too close to bedtime because digestion can interfere with your sleep. But will it really affect fat burning? Will eating close to bedtime really result in storing extra fat? The answer is no. As long as you are eating under maintenance, it doesn’t matter when you eat. I personally group my meals towards the end of the day and I find some carbs before bed can help me sleep better. It’s way worse for your fat loss goals to be stressed about meal timings because stress, or cortisol, results in reduced fat loss! So eat when you want to eat. Just make sure you’re following a sensible fat-loss diet. I love a Diet Coke as much as the next person. But I’m not kidding myself when I have one. 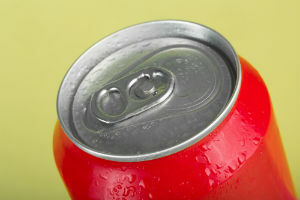 Research has found that artificial sweeteners can elicit the same insulin raising response as real sugar. Also, artificial sweeteners are just plain bad for you. If you want to blunt your appetite in a more healthy way, have a cup of coffee or green tea. After that, stick to water throughout the day. I hear this advice in hard-core bodybuilding circles from time to time. They tell you to take a f﻿at burner right when your head hits the pillow. The idea is that you fall asleep and the fat burner works its magic while you’re sleeping. It does work. But I hate this advice. I think it’s unhealthy plus it always gives me insomnia. Take your fat burner in the morning and early afternoon. Don’t take a stimulant right before sleeping. Cardio is great for weight loss but people who focus solely on cardio and neglect weightlifting are really do their fat loss a disservice. Lifting weights will not make you big and bulky unless you are specifically eating for that to happen. If you are following a fat loss diet and you do some form of strength training 3 times a week, you will lose fat faster, keep more muscle, and your body will transform into a great look. Many people will eat less and do more cardio and then they end up looking flat. But if you add a little bit of resistance training into the mix, you will look toned and cut. This works great for women and men. This is another piece of weight loss advice that is cited like gospel. You actually don’t have to completely ignore this one because it can work. If you eat 5-6 little meals a day, or eat a meal every 3 hours, you can lose a lot of weight. However, you really have to eat very little portions. The reason why it’s best to ignore this advice is because most people can’t eat as little as you need to in order to make this approach work. When I say little, I’m talking about meals that are smaller than the size of your fist. They are not satisfying and you will be really hungry. Most people go wrong because they eat too much in each meal and then don’t lose weight. This approach, like many approaches, can work but an easier option to follow for many people is to have 2 small meals and 1 bigger one each day. Or 1 small meal and 1 much bigger one. You have to find the right approach that works for you. Trust me, I know what it’s like to follow bad weight loss advice. I also understand why many people go wrong and used to believe some of these pieces of advice myself. Just remember that things aren’t completely black and white in the fitness world. Other than needing to burn more than you eat, there are very few (if any) rigid weight loss rules. Take everything you hear with a grain of salt (not literally, high salt consumption means more bloating). However, if you follow the advice in this guide, you’ll be fine and you’ll lose a lot of weight. Good luck! I wish you the best!